So what is next for our homes in the future? The answer? Battery powered homes. Many have been making the transition to solar power which is fantastic, the next step in getting away from fossil fuels is in batteries. 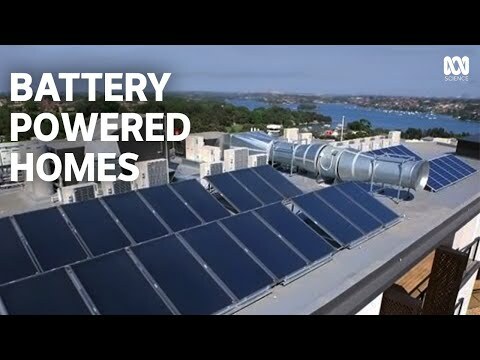 It is expected that over a million homes in Australia will have a battery powered home in the next five years. We have battery powered cellphones, battery powered cars are taking off so the leap to battery powered houses is the next obvious step, and it is already being taken. We are talking about the lithium-ion battery which supplies 24 hour renewable power. Solar panels can only do so much and you still have to rely on the grid however the battery has 8kw hours of usable stored power. The unit is about the size of a beer fridge and holds the battery, an inverter to make it usable for the house and energy management system controls in a little display on the door of the unit. The software tells the unit when to flow and where. The first house using one gets a large 53% of power from the battery, 44% from the solar panels and 3% from the grid. Lithium-ion is the lightest metal and was first made in the 1980’s but it easily combusted so lithium cobalt oxide was found, this went into electric cars and is what is now entering our homes. Thus giving the option of three scenarios, for those that are sick of power companies and/or want to be off grid altogether they need to buy a big enough battery to survive a cloudy week. Scenario two is living mainly off grid just using it for a backup. The third scenario is using the battery at night to avoid the expensive peak time power prices. What about cost? Well in early 2015 a 7k battery plus inverter installed would be about $15,000. However already in six months that price has dropped by about a third. Companies are leaping on board seeing the future heading there. For example in Adelaide homes are offered a $5000 rebate if a battery is installed. You see on the grid there is little power stored, the power stations are turned up or down in response to use, but if there is a sudden spike in use power stations have to turn to small stations to help supply the need. So batteries can help the grid running smoothly by the main stations buying power from a battery in homes which is why the big companies are getting on board. What about apartments or strata housing, how would it work with them? The strata would install them, the tenants would pay strata for electricity and strata would supply it. Whole suburbs can work with this new technology, Alkomoz beach is building and will have enough battery power to power 100 houses for 24 hours. They work on a grid credit system, they make power during the day then buy it back at night with the credits. Where to from here? Even better batteries are being invented like the zinc bromide battery which has two electrodes, a coin cell and a gel on top instead of liquid. This makes the battery charge faster, it’s bendy and won’t crack and has a longer lifetime that lithium. Builders want to put them into walls to power the home. This entry was posted in Media Release on February 14, 2016 by Esolar.